Hey isn’t this great? We’ve made a video of the DS4800 so you can see it in all its glory. And what a lot of glory. Now that we have some industrial scanners available to test, we’re trying to up our game. With the Honeywell Granit 1910i, we froze it in a block of ice, threw it around, smashed it pretty solidly, and it held up to quite a bit of damage. Running it over with a pickup, then backing over it, did push it beyond its limits. But who drives over scanners anyway? And something to keep in mind- Honeywell offers their Service Made Simple comprehensive coverage plans at a remarkably affordable price. So even if you don’t plan on driving over your Granit, it’s less than $100 to get 1-day turnaround and repair or replacement if your scanner happens to fail. Given the cost of an industrial 2D scanner, and the environments they tend to be in, Service Made Simple is a no brainer. Here’s our video review, complete with frozen scanner and pickup testing. Our new video reviewer, Camille, has shot a review for the Motorola DS9208 barcode scanner, a retail 2D imager that can also read barcodes off cell phones. We’ve got a video up from Jessie, our grand new video reviewer. This time we’re taking the Honeywell Voyager 1200g for a spin, and trying our best to recreate the video they made of the scanner reading nasty and scratched out barcodes. Two weeks ago I had the opportunity to head out to Las Vegas for a Honeywell Scanning & Mobility Partner Conference. Hosted at the beautiful Aria Casino & Resort, we covered a lot of territory, including various social marketing techniques and ways to build your brand online. I also got to meet Terry Bradshaw’s brother. That was pretty special. He’s quite tall. Along with some breakout sessions – I think they’re added so supervisors feel less hesitant to send employees to Vegas for three workdays – we got to get a sneak peek at the Voyager 1200g, heir apparent to the Voyager line of barcode scanners and most likely 1D laser scanning champion. Available sometime in early 2011, the scanner will be taking the place of the fantastic selling original Voyager. I’m pretty sure the Voyager was firmly established even before I got into the industry in 2006. That’s phenomenal longevity for most products, let alone one tied to the quick turnarounds of consumer/business technology. The Voyager 1200g maintains the same design style as the original (some say it totally looks like an alien), but with some additions to make it a bit more durable. The trigger button is covered with a rubber gasket that extends to the hood, not only protecting it from drops and bumps but helping maintain an IP42 seal. The internal components are situated on a single board, eliminating performance issues from worn or damaged internal connectors. I got to test it out during the conference, and it definitely feels like the Voyager we’re all familiar with, but upgraded in some good ways. The rubber over the scan button feels good, and the tactile response is firm and reminiscent of a television remote. It’s light and has a good balance so you could hang onto it for a while without your arm feeling the burn. Once we get one in house, I’ll write up something a little more quantitative, but for now it feels like 2011 is going to be a good year for barcode scanning technology. Part of the fun of being a product manager is getting to know manufacturer reps. These guys & gals live and breathe their product line, and they’re more than happy to extol the virtues of their new fantastic product. I figure there’s either some kool aid involved, or the smell of new plastics has some sort of mind altering effect, because they exhibit a level of exuberance I’m more accustomed to seeing at a Disney theme park. The reps seem to enjoy picking my brain about products as well. A few have said that often times we have a view of what our customers need that might not line up with other resellers or developers. Twelve cell phone radios might not be what our customers need. But sometimes a product comes out that so specifically hits our main user base that we know it’s going to be a knockout even when it’s just a 3D render and a few buzzwords. 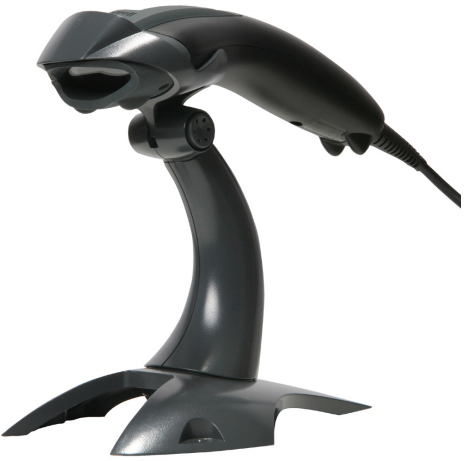 The Motorola CS3070 barcode scanner is one such item. For the longest time, Motorola/Symbol (or Motorymbol if you dig synergy) had been manufacturing & shipping out the CS1504, a batch barcode scanner that ran on a few watch batteries and looked like something you’d find at the bottom of a toy chest. As far as I can tell, it wasn’t designed to take the market by storm, but it was a good and inexpensive way for businesses and consumers to scan a ton of barcodes and output them into a spreadsheet. We sold our share of them, and customers really liked the fact that you could perform basic inventory management for under $400. But the scanner was pretty lacking and showing its age. The scan engine was an older model that seemed underpowered compared to its cabled brethren, 3 disposable watch batteries really doesn’t scream environmentally friendly, it was very much something that needed some refreshing. And whenever our rep came to visit, we’d mention that if they put together a newer unit, with a rechargeable battery, we could probably move a few. And so they did, and in a big way. The Motorola CS3070 takes entry level batch scanning and makes it easier than you could imagine. Because people often imagine scanning tons of barcodes and exporting it to something else. They’ve built it with a rechargeable lithium-ion battery that charges over USB no sweat. It’s available in two flavors, straight up batch data sending and Bluetooth. The Bluetooth model acts as a regular cordless scanner, or it can send batch data over USB like its radio-less partner. What sets it apart from the Opticon OPN 2002 is that the CS3070 has 512 MB of flash memory. Motorola claims that’s enough memory to store over 1 million barcodes and timestamps, however the OPN 2002 can store around 20,000 with its 1 MB of memory. I did some a little math, because math is fun, and with a straight comparison, 512 MB could theoretically store 10.2 million barcodes. Possibly. I don’t know who has that many barcodes, but it’s a possibility. The CS3000 actually mounts as a USB device, so you can grab the barcodes manually and not have to install a bunch of drivers. And because the CS3070 mounts as a flash drive, you can install software onto it, and after setting up an autorun file on the unit, whenever you plug it in it’ll run the apps you need. So now instead of having one computer that syncs your devices, the device does all the work. I could see this being a fantastic solution for businesses who have gift registries and multiple checkstands. You don’t have to wait for the licensed computer to be open; the license travels with the device.